I am reviewing this 1923 book in our “Old Book Update” for a few reasons. First, it is a classic and every Christian ought to know about it. Machen was one of the Princeton theologians who, along with B. B. Warfield, fought encroaching liberalism in the first part of this century. This book has been reprinted by Eerdmans in 1994 and sells for about $10. Second, not having read the book since seminary, I find it (and many other older books) interesting to read at this time. Our generation approaches any writing from before our time as antiquated and from an uninformed and pre-technological era. What I usually find is a style and depth of writing that is just the opposite. I am forced to slow down, think more deeply and accurately than with most contemporary Christian writers. We need that! 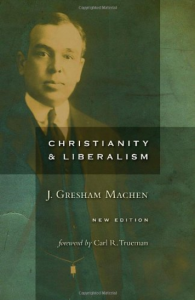 Third, I also think that if you just forgot, or didn’t know that Machen was writing in 1923, you would think this book was written with a first-hand knowledge of the church today. If you just read Christianity Today’s current issue (5/20/96) on Postliberalism, you might think Machen wrote with that in view. His fight for the historical reality of Christianity in the face of the old liberal mythologizing, is totally relevant to our fight regarding Postliberalism’s metanarratives, separating the biblical text from the truth it represents.